36 card set of tobacco cards issued by Godfrey Phillips in 1938. Issued out of Great Britain. Each card measures approximately 2-1/16" x 2-3/8". A colorful set of cards in the size and style of other Godfrey Phillips sets such as Famous Love Scenes and Shots from the Films. The "Characters" highlighted as "Coming to Life" in this series are distinctly British in tone though with some exceptions that are American in character and/or Hollywood based performers. 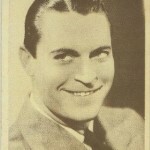 Included in the set are such stars as Joan Crawford, Clark Gable, William Powell, Greta Garbo, Loretta Young, John Barrymore, Lionel Barrymore and others. Charles Laughton is featured on two separate cards in the set. The following gallery shows off the entire 1938 Godfrey Phillips Characters Come to Life set of tobacco cards. Just click on any image to open to full size and from there you can scroll through each card in the gallery. Text checklist follows below.